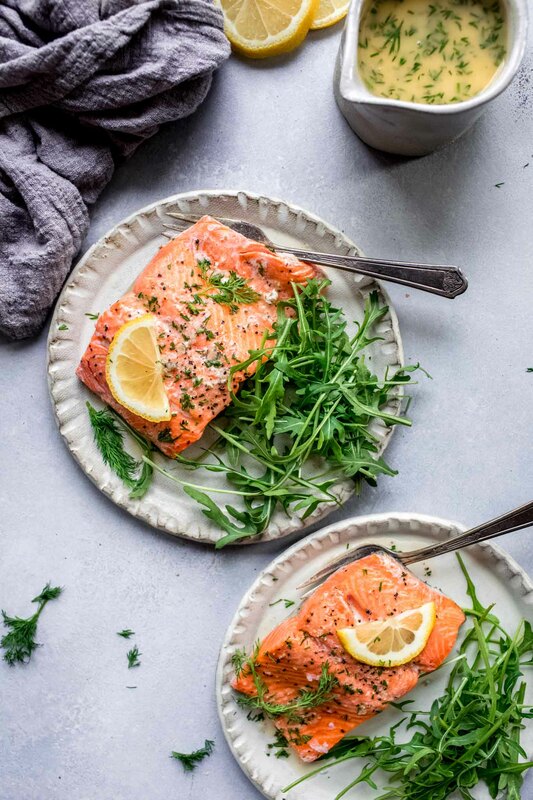 Pressure Cooker Salmon served with a delicious lemon-dill sauce will be on your dinner table in less than 15 minutes. 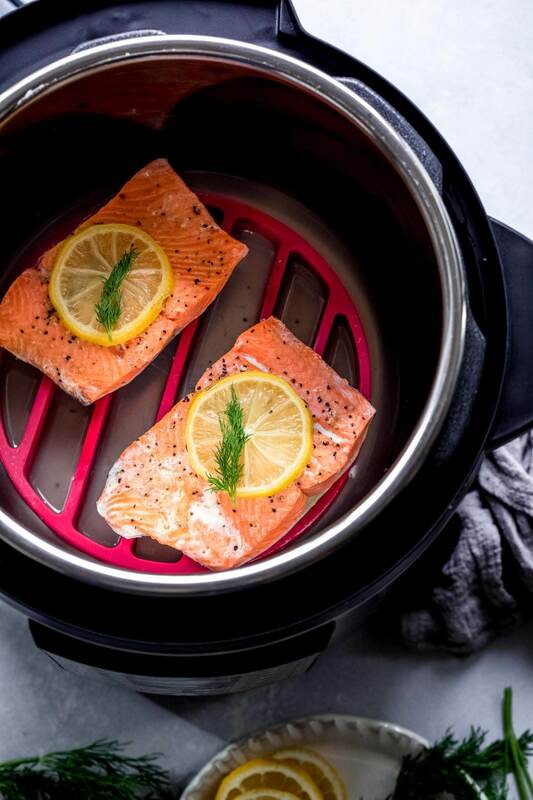 Plus, you can cook your salmon in the pressure cooker from fresh or frozen – perfect for last minute dinner planning! Big thanks to OXO for partnering with me on this post! Salmon is one of my go-to proteins when I’m looking to fix a dinner that’s on the lighter side. Traditionally I’ll bake it in the oven on a sheet pan with some veggies arranged around it, which makes for the perfect easy dinner with minimal cleanup. But, I wanted to change up my salmon routine and put one of my favorite appliances to the test in making it – the pressure cooker. I know that I’ve got a lot of dedicated pressure cooker fans out there. In fact, out of my top 10 recipes on the blog, five of those are pressure cooker recipes. 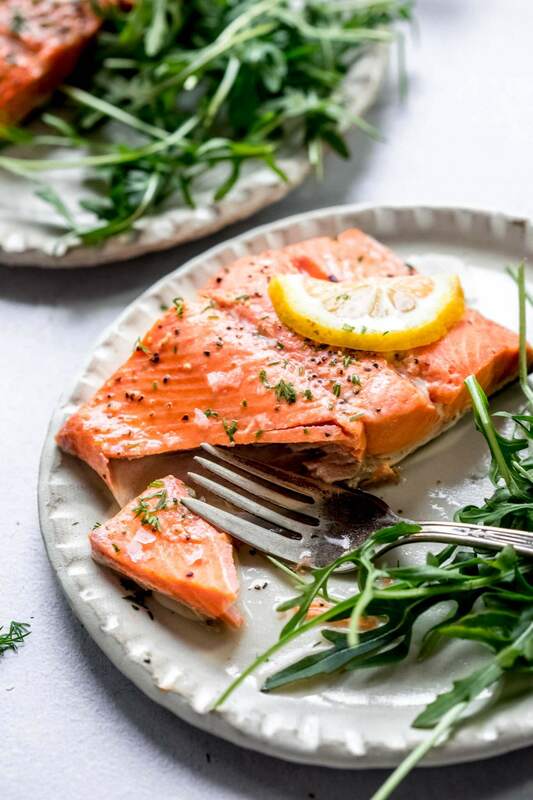 So friends, this recipe is for you – Pressure Cooker Salmon with Lemon-Dill Sauce. How Do You Make Salmon in the Pressure Cooker? It’s super easy to cook salmon in the pressure cooker. Just add a cup of water to your pressure cooker, place a rack on top, and then add your salmon. I like to season it with some salt and pepper and place a few lemon slices on top for added flavor. The rack ensures that the salmon is elevated above the water, so that it won’t get water logged. I recently discovered this Silicone Pressure Cooker Rack by OXO. I love that because it’s made from silicone, the food doesn’t stick to the rack. Plus, it’s super easy to clean, and dishwasher safe. It can also be used as a trivet, which essentially means you’re getting two kitchen tools in one. In fact, I loved their Silicone Rack so much that I also picked up the OXO Silicone Pressure Cooker Egg Rack and the Silicone Pressure Cooker Sling. 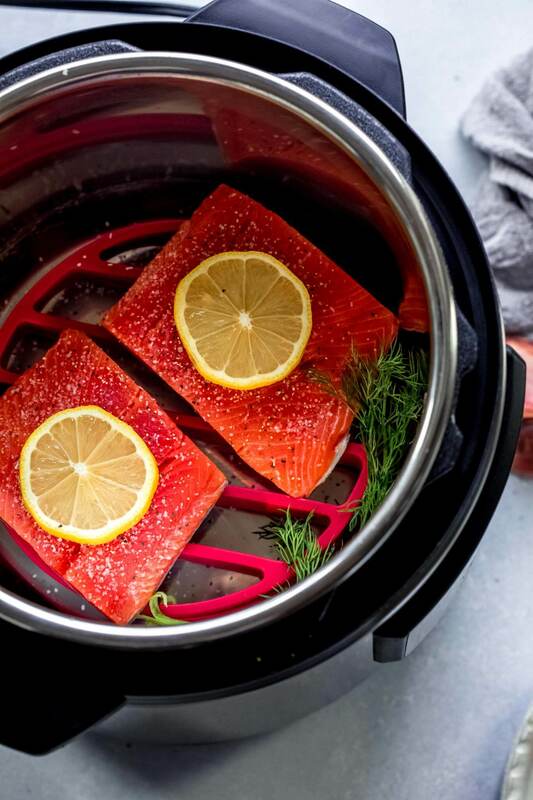 Can You Cook Frozen Salmon in the Pressure Cooker? You can cook frozen salmon in the pressure cooker – all you need to do is add two minutes to the cook time. So, instead of cooking the salmon for 3 minutes in the pressure cooker, you’ll cook it for 5 minutes. Can You Cook Salmon with Vegetables in the Pressure Cooker? I prefer to cook my vegetables separately from the salmon in the pressure cooker. Why? First, I find that vegetables like broccoli, cauliflower or carrots tend to have a strong aroma when pressure cooking. That means the salmon ends up tasting like the veggies. 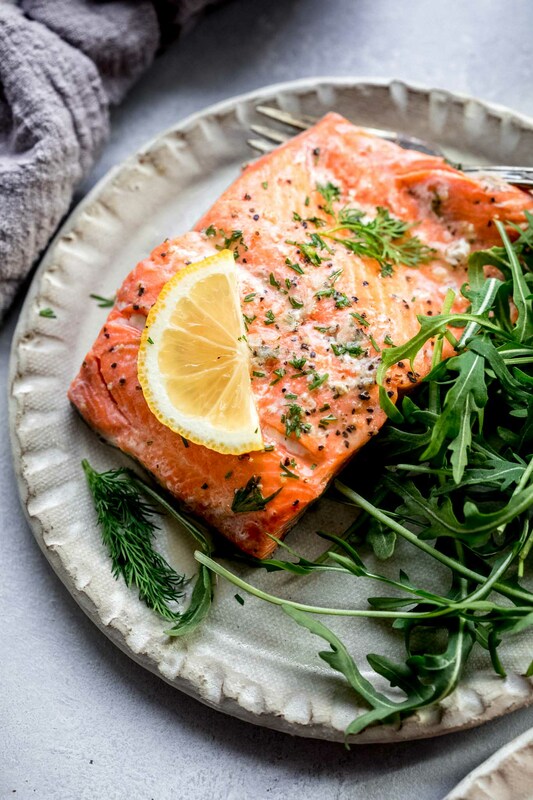 Second, vegetables will cook much faster than the salmon, meaning that your vegetables will become mushy if cooked for the same amount of time as the salmon. But, there is a workaround for all this! After your salmon has finished cooking, remove it to a plate. Then arrange your vegetables in a steamer basket, like this one from OXO, and add them to the pressure cooker. Using the same cooking liquid from the salmon (since it’s already hot), seal the lid and set the cook time to ZERO minutes. The pressure will build again (but quicker this time since the liquid is already hot) and then the timer will go off. Be sure to release the pressure right away, and then serve the vegetables alongside the salmon. I’ve found that pressure cooked salmon does not have as much flavor as pan seared, or roasted salmon and that’s why I like to prepare a sauce to go alongside. 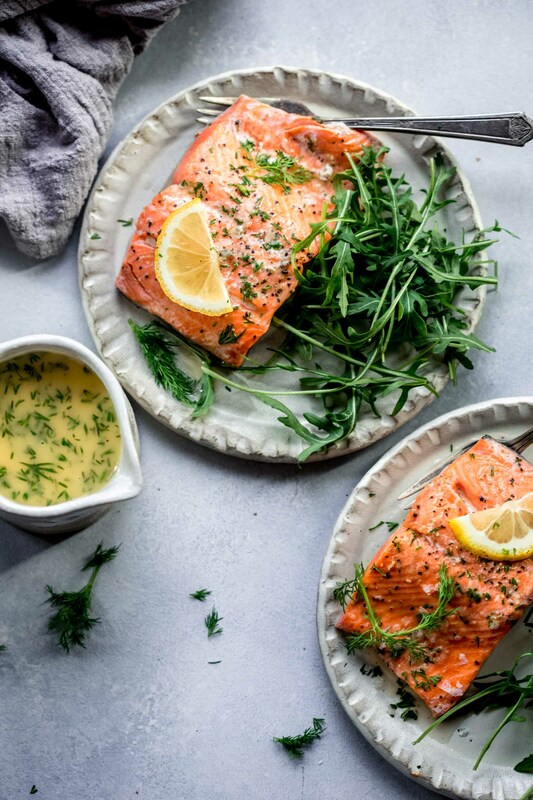 This lemon-dill butter sauce is the perfect accompaniment to the pressure cooker salmon, and you can make it on the stovetop in the same amount of time that it will take to cook your salmon. Of course, if you don’t feel like dirtying one more pan, you could also make this sauce in the pressure cooker using the SAUTE function. Just remove the cooked salmon to a plate, empty the cooking liquid, and proceed to make the sauce in the pressure cooker. Have you tried any of OXO’s Pressure Cooker Accessories? What’s your favorite? If you loved this Pressure Cooker Salmon, I would appreciate it so much if you would give this recipe a star review! Also, be sure to snap a picture of your finished dish and share it with me on Instagram using the hashtag #platingsandpairings and tagging me @platingsandpairings. 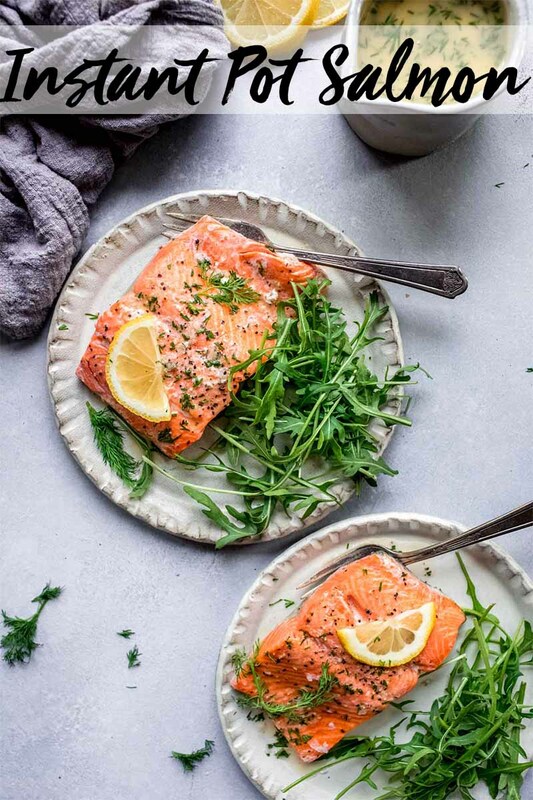 Pressure Cooker Salmon served with a delicious lemon-dill sauce will be on your dinner table in less than 15 minutes. You can cook from fresh or frozen. Pour water into pressure cooker and place Silicone Pressure Cooker Rack on top. Place salmon, skin side down on rack, in a single layer. Sprinkle with salt and pepper and cover with lemon slices. Put lid on pot, and lock into place. Set valve to sealing. Cook on MANUAL (high pressure) for 3 minutes (5 minutes for frozen). It will take about 10 minutes for the pressure to build, then the countdown timer will begin. Once the timer goes off, press the CANCEL button, and quickly release the pressure. 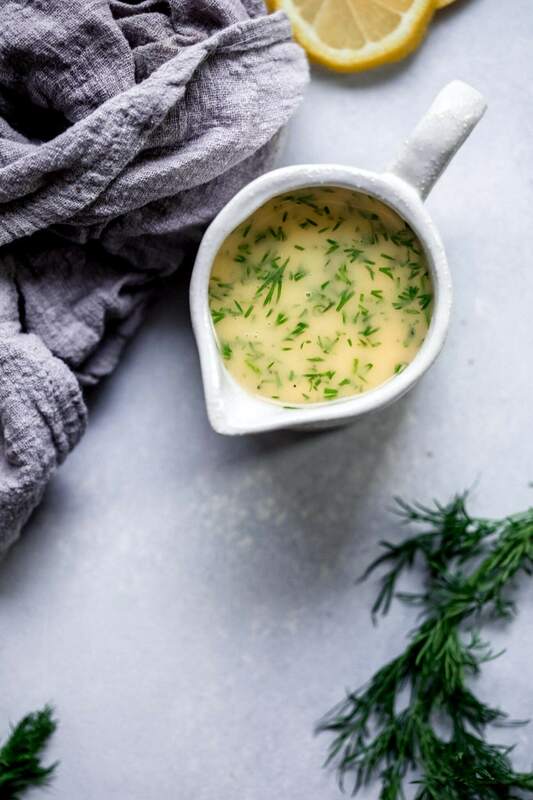 While the salmon cooks, make the lemon dill sauce. Boil wine, shallot and lemon juice in medium saucepan over high heat until reduced to 1/4 cup, about 6 minutes. Reduce heat to low; add butter, 1 piece at a time, whisking until melted before adding more. Remove pan from heat. Stir in dill. Season to taste with salt and pepper. Serve salmon fillets with lemon-dill sauce spooned on top. Enjoy! Pinot Gris has a nice acidity to it and its notes of citrus will pair well with the lemon-dill sauce. 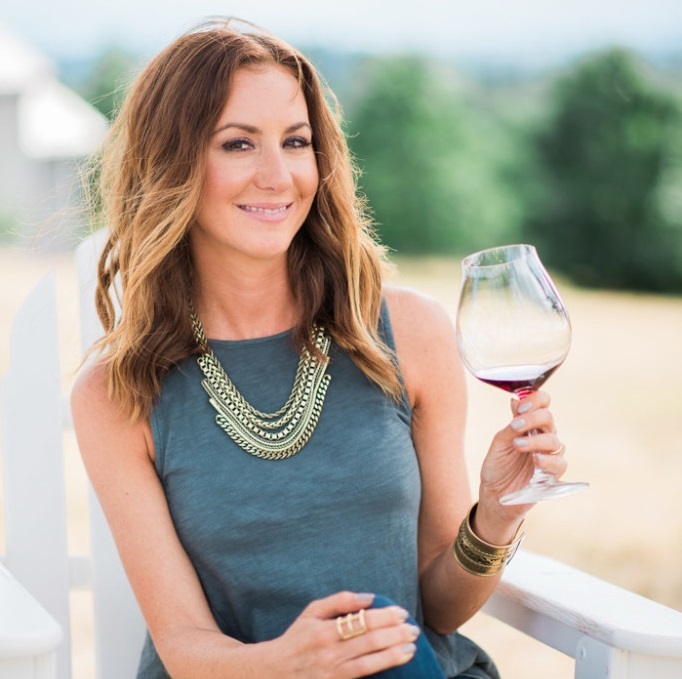 Want a red wine? A light Pinot Noir or young Beaujolais would also work well here – With a bit of acidity and a hint of earthiness, they make a great match for this dish. Looking for more pressure cooker recipes? Be sure to check out more recipes on the blog. I’m all in for the Salmon! I love using my pressure cooker! Yum! I bet that Pinot Gris is perfect with that lemon dill sauce! I’m kind of addicted to salmon cooked on the smoker, but only you could convince me to try it in the IP. I bet it would be a great one for a weeknight when I don’t have time to fire up the smoker. I’ll be giving it a shot soon! Smoked salmon is SO good! This is definitely a different version, but great when you want quick and easy! Looks like a delicious recipe. I’ll have to try it the next time we catch a salmon! I just got my instant pot and never thought to make fish in it. There’s still so much to discover, haha! There are so many things you can make with the Instant Pot! I am literally thawing salmon right now to cook for dinner- I am going to try your pressure cooker tips! Thank you! Girl! I just pulled out some salmon for dinner tonight! Thanks for the inspiration!!! (PS. I still have yet to get a pressure cooker. I KNOW! Last on the block… 🙂 PPS. Gonna check out your 1 sheet pan recipe too. I’m all about less dishes 🙂 )Happy cooking! Definitely give those sheet pan salmon recipes a try Melissa! Cheers! !